With this App you don't need internet connection to read aboutDigital Marketing concept. This tutorial will give anyone who isinterested in learning Digital Marketing all he need to becomeexpert in Digital Marketing for free. If you are student who ispreparing for exams about Marketing , researchers, graduatestudents or looking for online CPA job , seller or working indropshipping , this app is maid for you The tutorial lessons aredivided into comprehensive sections for fast and easy learning. Noprior experience is needed even a beginner can learn DigitalMarketing easily. Currently, we are covering following all thistopics: Digital Marketing - Overview Digital Marketing - SEODigital Marketing - Social Media Digital Marketing - ContentDigital Marketing - Email Digital Marketing - Mobile DigitalMarketing - Pay Per Click Digital Marketing - CRO Digital Marketing- Web Analytics Digital Marketing - Facebook Digital Marketing -Pinterest Digital Marketing - Twitter Digital Marketing - LinkedinDigital Marketing - Youtube Digital Marketing - Google AdwordsDigital Marketing - Google Analytics Thank you for using DigitalMarketing app and don't forget to rate it on Google play. We're moving to our new free All-in-One app! 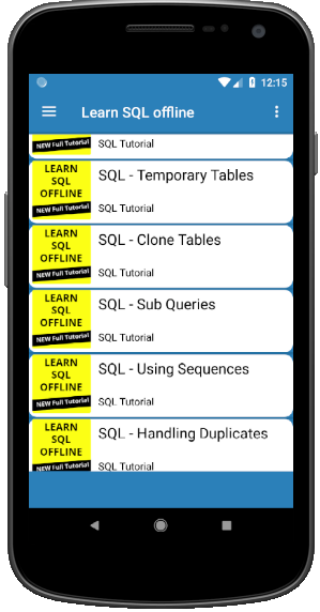 Get it here:https://play.google.com/store/apps/details?id=com.sololearn LearnSQL in a greatly improved learning environment with more lessons,real practice opportunity, and community support. Learn andpractice SQL right now, with SoloLearn’s FREE SQL tutorial! Create,access, and manipulate databases. At the same time, collect points,unlock levels and achievements, and compete with other learnersfrom around the world! Whether you want to become the next greatestdatabase designer, or you would simply like to have the ability toquery databases from code, SoloLearn will take you through thefundamentals of SQL in a highly interactive, rapid, and effectivemanner. Learn SQL covers an array of SQL-related topics, such as: •Database Basics • Key SQL Statements • Retrieving, Updating, andFiltering Data • Functions and Subqueries • Creating, Updating, andDeleting Tables • Joining Multiple Tables • Creating Custom ViewsBecome an expert the easy – and FUN – way! Continue playing whilelearning for FREE with SoloLearn! 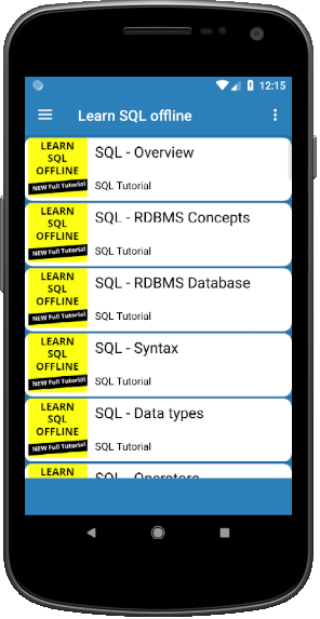 This is Learn SQl offline app developed for student who wanttolearn sql full course It has complete lesson for sql withexamplesDownload the app share with your friends must give usratingContains the following : "SQL - Overview", "SQL Tutorial""SQL -RDBMS Concepts","SQL Tutorial" "SQL - RDBMSDatabase","SQLTutorial" "SQL - Syntax","SQL Tutorial" "SQL - Datatypes","SQLTutorial" "SQL - Operators","SQL Tutorial" "SQL -Expressions","SQLTutorial" "SQL - CREATE Database","SQL Tutorial""SQL - Drop orDELETE Database","SQL Tutorial" "SQL - SELECTDatabase,USEStatement","SQL Tutorial" "SQL - CREATE Table","SQLTutorial" "SQL- DROP or DELETE Table","SQL Tutorial" "SQL - INSERTQuery","SQLTutorial" "SQL - SELECT Query","SQL Tutorial" "SQL -WHEREClause","SQL Tutorial" "SQL - AND and OR ConjuctiveOperators","SQLTutorial" "SQL - UPDATE Query","SQL Tutorial" "SQL -DELETEQuery","SQL Tutorial" "SQL - LIKE Clause","SQL Tutorial" "SQL-TOP,LIMIT or ROQNUM Clause","SQL Tutorial" "SQL - ORDERBYClause","SQL Tutorial" "SQL - Group By","SQL Tutorial" "SQL-Distinct Keyword","SQL Tutorial" "SQL - SORTINGResults","SQLTutorial" "SQL - Constraints","SQL Tutorial" "SQL -UsingJoins","SQL Tutorial" "SQL - UNIONS Clause","SQL Tutorial""SQL -NULL Value","SQL Tutorial" "SQL - Alias Syntax","SQLTutorial" "SQL- Indexes","SQL Tutorial" "SQL - ALTER TABLECommand","SQLTutorial" "SQL - TRUNCATE TABLE Command","SQLTutorial" "SQL -Using Views","SQL Tutorial" "SQL - HavingClause","SQL Tutorial""SQL - Transactions","SQL Tutorial" "SQL -Wildcard Operators","SQLTutorial" "SQL - Date Functions","SQLTutorial" "SQL - TemporaryTables","SQL Tutorial" "SQL - CloneTables","SQL Tutorial" "SQL -Sub Queries","SQL Tutorial" "SQL -Using Sequences","SQL Tutorial""SQL - Handling Duplicates","SQLTutorial" "SQL - Injection","SQLTutorial"
Learn Data Science on the go! 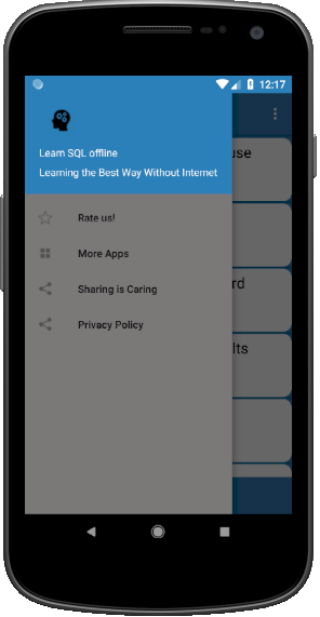 DataCamp Mobile offers bite-sizedlessons you can complete in 5 minutes or less. Expand your datascience knowledge with new courses by the best instructors, orsharpen your skills in Practice Mode with instant personalizedfeedback. Learn Data Science by doing, even on the go! Currently,three courses are available (for free! ): - Intro to Python explainsthe fundamentals of data science using the Python programminglanguage and the Numpy package for scientific computing. - Intro toR lets you master the basics of data analysis by introducingvectors, matrices and data frames. - Intro to SQL makes youcomfortable with the world of relational databases. New courseswill be added soon! This tutorial is based on the SQL*Plus 11g release by OracleCorporation.Oracle Database (commonly referred to as Oracle RDBMSor simply as Oracle) is a multi-model database management systemproduced and marketed by Oracle Corporation.If you are a beginnerand looking for a tutorial to learn SQL*Plus or Oracle DBMS,install this app now and start learning. It's an offline app andfree of cost.Contents> Basics> DQL (Data Query Language)-Intro- Projection- Selection- Joins- Datatypes and Constraints>DDL (Data Definition Language)> DML (Data ManipulationLanguage)> DTL or TCL (Transition Control Language)> DCL(Data Control Language)> Normalization> PLSQLMaking it easyto learn SQL. 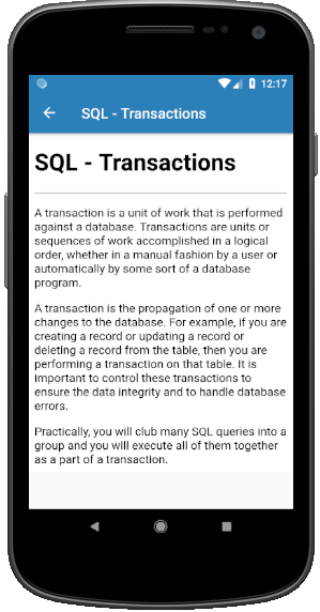 This application contains complete SQL Tutorials withscreenshotexamples that is helpful for the beginners who arecurious to learnSQL and also for preparing the tests.In thisapplication, you canlearn, SQL SELECT, DELETE, UPDATE, DROP,CREATE, ALTER and more SQLstatements.also, it includes all the SQLfunctions and operatorsused in the SQL. Later, you will learn aboutall the constraints,SQL joins, DATABASE objects included in the SQLwith deepexplanation and the examples.also, you will learn tomanage theROLES and USERS in Oracle database.